When you awake in the morning, let your first act be to salute My Heart, and to offer to Me your own…Whoever shall breathe a sigh toward Me from the bottom of his heart when he awakes in the morning and shall ask Me to work all his works in him throughout the day, will draw Me to him… For never does a man breathe a sigh of longing aspiration toward Me without drawing Me nearer to him than I was before. We fickle human beings seem always to grow hard and indifferent in our love. Hence, in the 17th century God sought to melt our stony cold hearts with a new manifestation of His Love, that of the adorable and irresistible “Sacred Heart of Jesus.” Of course, behind cloistered walls love for Him had never died, and numerous saints were brought to glory through that gaping wound in Christ’s side from which He poured out His Heart to them, and they, in turn, sought to bury their own hearts in the safe refuge of His. One such saint was St. Francis de Sales who, along with St. Jane de Chantal, founded the Daughters of the Visitation from whom would come the disciple of the Sacred Heart of Jesus, St. Margaret Mary Alacoque. The order was built on Christ’s words, “Learn of Me for I am meek and humble of heart,” and their spirituality was symbolized with a heart crowned with thorns, two arrows piercing it, and a cross rising from its center. St. Francis urged his spiritual daughters to forever lodge in the pierced side of the Savior. He loved to remind them to rest their heads, as the beloved disciple had done, on the breast of Jesus, and to lose themselves in that sweet ecstasy of silent contemplation of and holy communion with the Divine. My Divine Heart is so passionately in love with men that it can no longer contain within itself the flames of its ardent charity. It must pour them out by thy means, and manifest itself to them to enrich them with its precious treasures, which contain all the graces of which they have need to be saved from perdition….I have chosen thee as an abyss of unworthiness and ignorance to accomplish so great a design, so that all may be done by Me. Oh, the lament in His tone as He speaks to our own coldness and ingratitude. My Heart beats with compassion for the sorrows of man. Oh, how gladly would I help him bear the weight of his terrible cross, fashioned, for the most part, by his own guilt! But alas, he will have none of My help. So I am forced to stand by the side of the road and watch him struggle hopelessly in his agony. O man, what have I done to you that you should refuse My aid?...There are so few souls that believe in Me and My love. They profess their belief and their love, but they do not live this belief. Their hearts are cold, for without faith there can be no love…. My daughter, I am not loved in the homes of men. And because I am not loved, the Divine Trinity refuses to dwell therein. Children are not taught to love Me, because those who have charge over them have no time or patience to do so. How like the sorrow Jesus expressed to St. Margaret Mary are His words here to Sister Mildred Mary Neuzil. Surely He has sent His own dear Mother as a last resort to attempt to fan the dying embers of our burnt out love, smothered by so many cares of the world and so many of its illusions, confusions and deceptions, so many things and people who draw us away from that irresistible Love that is the Sacred Heart of the Sacred Humanity in the heart of the Most Holy Trinity. Listen to His Mother as she begs us to come to her so she can teach us how to learn what is true love, the only true love which comes from the Heart of Jesus, our only salvation. Who could have known the gaping wound in the pierced side of Jesus better than the Woman who stood by His cross weeping? And who could have sought solace in that Sacred Heart that carried her along that way of the cross with Him more than His Sorrowful Mother? Not only has Jesus given us His most Sacred Heart, but He has given us the pure and Immaculate Heart of our Queen-Mother, a heart inseparable from His, a heart so dear to Him He can never refuse it. Then let us hasten to Mary’s side and take her hand and walk with her straight into the Heart of Jesus to make His Heart our dwelling place, our temple, our sanctuary. O dare we ask that Sacred Heart to do for us what He has done for so many saints before us! 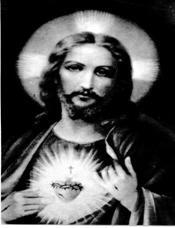 O dare we ask that Sacred Heart to take our poor and wretched hearts and give us His very own! O dare we ask of Him to set our hearts on fire and make of them a living flame, a burning torch, to bear God’s love to all the world and set it, too, on fire?